This installment of the Cultures of Celmae-series clocks in at 24 pages, 1 page front cover, 1 page editorial, 2 pages of SRD, 1 page back cover, leaving us with 19 pages of content, so let’s take a look! The briranor, prior to the Shattering, were an isolated people, dwelling on the Emerald Isle (fully mapped in full color!) – a tribal people fighting as much amongst themselves as with the orcs. When the Shattering tore Celmae asunder, they faced titanic beasts and had to retreat, in unity, to the newly unearthed cities of ruins opened to the sky by the now floating landmasses. Occupying the remains of this erstwhile civilization, they tried to rebuild…but soon had to come to grips with not being alone: The majestic behir and the briranor, after a tentative first contact, entered into an alliance that persists to this day, an alliance that allowed them to reclaim their lands. 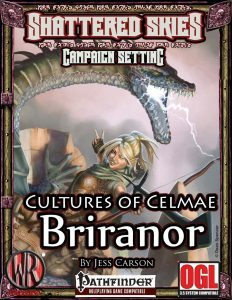 Initially reluctant to mingle with the strange new race they found in their once homes, the briranor soon mingled with the new elven race – and thus was born a race that could be summed up as Celmae’s half-elves…though I prefer briranor. Why? Because, perhaps for the first time in ages, I feel that the hybrid race has a concise and distinct identity. Massive kudos!! The supplement then does something remarkably different – something I applaud: It takes a deeper look at the lands of the Briranor, covering all major settlements to be found within this region of the world, including settlement statblocks and lore galore and copious adventure hooks contained in the vivid prose. This made the region, at least to me, come to life more so than any before in the series. As a nitpick, the gold values in the statblock marketplace sections have been italicized, when they shouldn’t be, but that’s, as mentioned, cosmetic. The gazetteer also covers the emerald pull, the fey-territory mentioned before. The pdf also sports crunch, though – in this instance, that would be the behir rider, who receives d10 HD, 4 + Int skills per level, full BAB-progression and good Fort-saves. The PrC can be taken at 8th level, provided you can meet its criteria, and has a cool flavor requirement (two thumbs up) – namely that the prospective rider must have single-handedly defeated a behir. Ouch! Love it! The PrC begins with a young behir companion (proper animal companion stats included!!) as well as behir empathy, a behir-centric-version of wild empathy. The base behir companion is powerful – and has a great catch: If the behir rider has another mount, eidolon or familiar, the “behir will kill and eat it”. That’s so deadpan…I love it. It made me actually laugh when I read it. 2nd level nets behir’s stance, which provides a +1 bonus to CMD versus trip attempts, which increases by +1 every even level thereafter. 3rd level nets natural armor +1, increasing this every odd level thereafter. At 4th level, the PrC receives combination charge, which nets the behir a free bite attack when the rider is charging. 8th level allows the behir to execute the breath weapon at the end of the charge (with a caveat to prevent recharge abuse!) and as a capstone, we have a decrease of the recharge time for the breath weapon by 1 and immunity to electricity for the rider. The behir companion begins play with 8 HD and increases these to 15, has good Fort- and Ref-saves, increases skills from 8 to 15, natural armor from +6 to +12 and increases Str and Dex by up to +6 over the course of the 10 levels of progression. During the class advancement, the behir also receives 7 bonus tricks. It begins play with link, with 2nd level providing devotion (+4 to Will-saves vs. enchantment) and grab, 3rd level providing evasion, 4th constrict, 6th rake, 9th improved evasion and 7th level breath weapon. The 10th level provides swallow whole. Powerful, yes, but ability-dispersal-wise and considering the relative dearth of good abilities in the base PrC, more than justified. Now, there is one baffling oversight: The second page of the behir’s rules-text…is completely italicized. It’s a cosmetic glitch, but one that even casual inspection could have caught. Still, as a whole, my favorite class-design in the series so far! Next, we are introduced to 4 new deities (all with their own full color symbols) – there would be Ametus, the creepy deity with the needle-pointed fingers that wrested the secret of undeath from the Grey Maiden (Vecna, anyone? ), Lyria, patron of sun, passion and art, Reata, dual deity of love and lust as well as war (which makes a lot of sense to me!) and Wyre, master of dreams, magic and knowledge. Now these deities do have a couple of minor issues: Ametus and Lyria have two favored weapons, which makes the proficiency question and interaction of favored weapon mechanics problematic – do both weapons apply bonuses, if any? Lyria also gets one subdomain more than the other deities. The pdf sports 3 domains: Art, Dream and Passion: Art allows you to temporarily make regular items masterwork and 4th level allows the character to take bardic masterpieces, substituting spells known with spell slots…which sounds reasonable. Unfortunately, bardic masterpieces require the expenditure of bardic performance, which means that the domain…doesn’t do anything there, unless you have somehow access to the bardic performance class feature. The movement subdomain lets you touch a target 3 + Wis-mod times per day, forcing them to move gracefully away from you (nope, does not provoke AoOs). This one should have a save to negate. The sound subdomain provides basically a weaker version of inspire courage. Not blown away. The dream domain nets you the option to 2/day to apply a +5 bonus to AC or Ref-save of a companion. The wording makes me think that this should have an immediate action activation, but the ability does not specify one…so yeah. 8th level lets you scry while sleeping…and nope, the spell’s not italicized. The Passion domain lets you touch another to grant them bonuses to Perform, while 8th level provides immunity to non-magical fear effects and a bonus to saves versus magical fear. The pdf concludes with a new material, azure luster: The material is used for weapons exclusively (being to malleable for armor) and increases the damage of the respective weapon by one size category, but are ALWAYS treated as broken. The material also ignores the AC or shield bonuses granted by iron or steel armor (explicitly just these – bronze, mithril, etc. are good!) and may not even damage these materials – iron creatures would be completely immune versus these weapons! The cost, at +5K gp, is pretty low for the benefits…but then again, I LIKE it. It provides a great in-game reason for making armor and shields out of strange materials, for getting that bone armor…you get the idea. It feels a bit rough, but offsets that by being imaginative, ending the pdf on a high note. Editing and formatting…are not that good. I noticed several typo-level hiccups and formatting in particular, while better than in previous installments, sports some very obvious hiccups that should have been caught. Layout adheres to a nice two-column full-color standard and artwork consists of a blend of nice full-color original pieces and stock art. The pdf has no bookmarks, which constitutes an unnecessary comfort detriment. Jess Carson, with additional writing by Robert Gresham and Angel “ARMR” Miranda, delivers the by far best Cultures of Celmae-supplement I’ve covered so far. The flavor is more in-depth, with the gazetteer painting a more vivid picture of the regions and people in question. The briranor have a more distinct identity than most half-elves I have seen, which is a big plus. In fact, I was getting ready to sing some more pronounced praises here…and then, I stumbled over the deity-write-up section and the problematic (and partially boring) domains, which stick out like a sore thumb in the book. The deity-fluff is generally nice, if not too mind-blowing, but the domains…are simply not as refined as they should be. Compared to both PrC and new material and the cool ideas they represent, this section feels…less compelling. This is an inexpensive pdf, yes. But the domain issues do drag this down a bit, unfortunately, to the point, where, in conjunction with the pretty nasty formatting issues, I can’t rate this as high as I’d like to. It should also be noted that bonus types could have used a more rigorous codification in this supplement. Still, of the early Cultures of Celmae-books, this is BY FAR the one most worth getting! If you’re looking for more culturally distinct half-elves, it could very well be exactly what you’re looking for! Still, with the formal issues, I cannot go higher than 3.5 stars, rounded down to 3 for the purpose of this platform.